After a 17-month hiatus, Mad Men finally returns. Note: This post will contain spoilers for the premiere of Mad Men. When Mad Men first came on air in 2007, it was a dark time for television. The Sopranos (which Mad Men creator Matt Weiner had worked in as a writer) had just ended its legendary run, a big hit for television. The Wire wasn’t to come back until 2008 (which was still ignored by the Emmys). So television was remarkably surprised when AMC, a network known for showing classic films, aired what many call one of the greatest TV dramas of all time. Mad Men‘s arrival on television can be considered as influential as The Sopranos or The Wire. When The Sopranos came out in 1999, the TV drama was still really undeveloped. Just for proof, name 10 great TV dramas before then. Not a great list, right? The Sopranos‘ form of story telling led to a wave to pay-for Cable, and brought the rise of shows like The Wire and Deadwood. Mad Men didn’t have as extreme as an effect as The Sopranos did for the TV drama, but it brought the same wave to basic cable. With the exception of The Shield and a few others, there wasn’t a deeply-praised basic cable drama. But afterward you had Breaking Bad, Justified, and plenty of others. 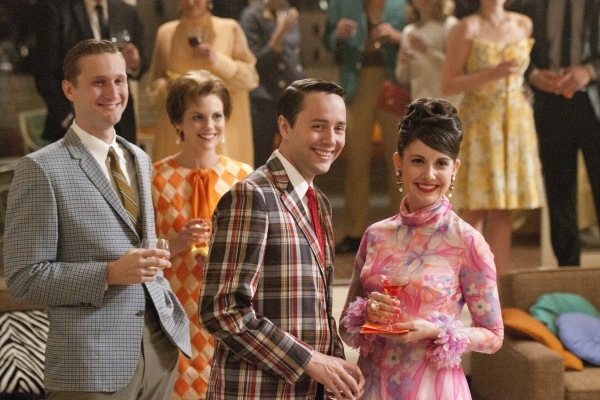 When we last left Mad Men, it was 1965. Don just got married to Megan after going to Disney World, leaving viewers questioning what would happen next for them and of Joan’s baby. Now it’s 1966, and we learn Don did marry Megan and Joan did have her baby. The episode didn’t drop this heavily, and went in slowly. It wasn’t exactly a shocker for the audience. It was strange that Megan now is a central character, and it kind of just popped out. The main arc of the episode revolved around her reactions with the rest of the workers at Sterling Cooper Draper Pryce’s business and Don himself. It was strange that with Megan, Don acted different. At the beginning of Mad Men, Don was a character as cold as Tony Soprano. Now, he acted, well, nice. He wasn’t a Ned Flanders, but it surprised the other characters (Roger said he had never seen Don blush before after Megan performed the song “Zou Bisou Bisou”). Now there were certainly many subplots that I have to mention to, like the stand-off between Pete and Roger, Peggy’s anger at Megan for easily getting a copyright job that Peggy had to fight for, and Joan worrying that she may have lost her job. Also, there was the small sub-plot of the Civil Rights movement and a reference to the Vietnam War. What makes Mad Men such a clever and great show is the history. The 60s was the transition period for America, from the age in the 40s and 50s to the wild 70s, 80s, and even today. I was interested in the Civil Rights part of the episode (I kind of wish that was expanded), and the ending, which featured many African-Americans applying for a receptionist job made me thrilled. Mad Men doesn’t always do this correctly (remember the JFK assassination episode), but it always gives the show a sense of realism that most shows now on TV lack. Mad Men has always been perhaps the fascinating show on television and will go down as one of the greatest in history. The 17-month hiatus was worth the wait. On a self-explanatory note, this is my 200th post. Thanks to all my loyal readers who have encouraged me to write this much.